Let’s kick things off here by just admitting that I feel so very blessed to live in close proximity to Nino Salvaggio in St. Clair Shores. I have been visiting Nino Salvaggio’s for as long as I can remember. My mom used to go shopping here all the time and my mind was always blown by the beautiful, colorful fruit and vegetable displays there. It is sort of like a work of art… an installation of the prettiest produce your eyes have seen. Nino Salvaggio takes pride in the products that they sell, and it shows! This store is absolutely stunning and you can see that they pay attention to detail. 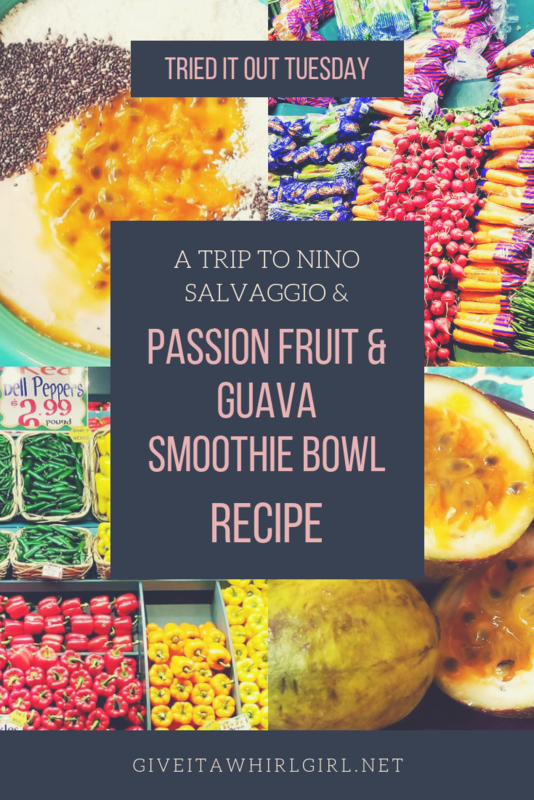 Today I will also be sharing a recipe for an exotic fruit smoothie bowl that I created with passion fruit and guava. Passion fruit is one of my favorite fruits and I love the sweet and sour taste of it. Guava is another favorite exotic fruit of mine and I don’t get a chance to enjoy it very often. I could not resist buying one from Nino Salvaggio. Produce section of Nino Salvaggio – Isn’t it just spectacular? Nino Salvaggio is the go-to place in the area if you want some perfect and flawless ingredients in your food. It’s not just fruits and veggies though! Nino Salvaggio also has a deli and meat counter. They also have a great little grocery section with some very cool, unusual ingredients. And you just have to see the gorgeous bakery at Nino Salvaggio. I get my chocolate cassata birthday cake from Nino Salvaggio every single year. And speaking of birthdays, mine is next month and I will be enjoying that cake soon! Yippee! Nino Salvaggio has four convenient locations in Michigan to serve you. They are located in St. Clair Shores, Troy, Clinton Township, and Bloomfield Township. You can find out more about Nino Salvaggio and their mission HERE. This is a store that is highly committed to providing high quality foods. I visited Nino Salvaggio this past weekend to pick up some exotic fruits. I knew ahead of time that I wanted to pick up a couple passion fruits (one of my all-time favorite fruits). The dilemma was that I really was not quite sure what I wanted to combine it with for my smoothie bowl. Then I saw the guava and I knew that would pair well with the passion fruit so I took home one of those. The exotic fruits section at Nino Salvaggio is the most interesting place to shop, for me anyway! This is the spot in the store where you can get brave and muster up the strength to try something new! So this is the fruit that I was really going after with my trip to Nino Salvaggio. Passion fruit just might be one of my all-time favorite fruits to chow down on. With the passion fruit, you get the wonderful combination of sweet & sour. If you don’t like the texture of tapioca you probably won’t like this. It does, to me, have a tapioca texture. It is slimy and seedy but the taste blows my mind. Using this as the star of my smoothie bowl was a wise choice! Passion fruit is a nutrient-dense fruit that has a great amount of Vitamin C in it and it is great for the immune system. The passion fruit also has some fiber, Vitamin A, potassium, and a bit of iron. It is a small fruit and contains around 17 calories per serving. You can learn all about the health benefits of the passion fruit HERE. Guava is the second fruit that I ended up going with for my smoothie bowl. These guavas are oh so yummy but they are pricey! I only took home one small guava. One turned out to be just enough for the flavor that I was going after. As far as nutrition goes with the guava fruit, you are going to find some antioxidants, Vitamin C, fiber, and beta carotene in the fruit. There are 8 wonderful health benefits of the guava fruit and you can feed your brain with knowledge over here. Now here is an interesting piece of fruit! This is a rambutan and it sort of reminds me of lychee fruit. I was really tempted to get more of these but the steep price deterred me and I only purchased one! Me and my daughter, Chloe, split the rambutan in half and we each tried a small piece. It definitely does have a taste reminiscent of lychee. The flesh was soft and also reminded me of grapes. I would give this a whirl again. We really enjoyed the experience of trying this unique fruit. Quince is a new-to-me fruit too. Never ever had one in my life had quince! These tart fruits are grown in Chile and you can eat them raw, but it is advised to cook these if you want the best flavor to come through. The ya ya pear is a pear that originates from China. This white pear’s flavor can best be described as a cross between a rose and a pineapple. The ya ya pear is crisp and sweet, but not overly sweet. Just the right amount of sweetness! For this Passion Fruit/ Guava smoothie bowl I used two frozen bananas, two passion fruits, one guava, coconut milk, chia seeds, and coconut flakes. This tropical smoothie bowl makes a fantastic treat for breakfast! Want a smoothie bowl with exotic flavor? Give this tropical passion fruit and guava smoothie bowl a whirl! Place two frozen bananas, 1 passion fruit, 1 guava, and 1/4 cup of coconut milk in the blender. Use your smoothie mode if your blender has one. Once blended up pour the smoothie mixture into a large bowl. Soup bowls work well. Top your smoothie bowl with some shredded coconut flake and chia seeds. And now you can use your other passion fruit to top the smoothie. Eat and enjoy! Hope you love it! Sounds strange (maybe??) but I sure do get excited about taking a little trip to my favorite fruit & veggie store- Nino Salvaggio! If you are looking for top-notch produce you will find whatever it is you are looking for at Nino Salvaggio. Definitely make sure you visit the exotic fruit section of the store. What you need to do next is get brave and try some of these unusual fruits and vegetables. My blog is all about trying new things and eating with an open mind. I hope this inspires you to eat with an open mind. There is an entire universe full of unusual food and it is just waiting for you to give it a whirl! Question time! Have you ever been to Nino Salvaggio? Leave me a comment and let me know what you think about this incredible place to shop! This entry was posted in Local Spots I Visited, Recipes, Tried It Out Tuesday and tagged breakfast, exotic fruit, fruit, gluten free, grocery shopping, guava, healthy, healthy breakfast, healthy food, nino salvaggios, passion fruit, quince, rambutan, recipe, shopping, smoothie, smoothie bowl, St Clair Shores, yaya pear. Bookmark the permalink. This smoothie bowl sounds really fresh and perfect for those heavy meals we tend to have during the winter months. Thank you! Definitely a unique, healthy breakfast. I shared it with my daughter. All those fruits look so exotic and fun! The passion fruit and guava smoothie bowl looks like perfection! Thank you! I have been obsessed with their exotic fruits forever. Can’t wait to try more. That fruit looks so fresh and that market definitely looks like a must visit. My husband has family in Detroit, so I’ll have to let his family know about this. Thanks! It is definitely worth stopping at. Their meat counter and bakery are superb as well. Wow – the colors of the produce are just so stunning and vibrant – how we should all strive to eat a variety of colors from nature. I’ve never been that far north, but if I ever venture that way, I’d love to check this place out. OMG! Looks delicious and so mandy different fruits for me to try!! I haven’t heard of smoothie bowls before, but I am loving this idea. And that grocery store looks like heaven. Everything look so fresh. They are simple to make and oh so delicious!